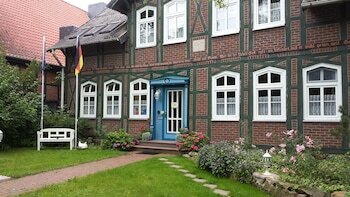 With a stay at Sonnenhof Im Wendland in Clenze, you'll be 15.3 mi (24.6 km) from Jenny-Marx-Haus and 18.7 mi (30.1 km) from Archaeological Center Hitzacker. Featured amenities include complimentary newspapers in the lobby, luggage storage, and a safe deposit box at the front desk. Free self parking is available onsite. With a stay at Motel 24h Bremen Ost in Bremen (Osterholz), you'll be within a 10-minute drive of Weserpark and University of Bremen. Free self parking is available onsite. With a stay at Ferienwohnungen am Holstentor in Luebeck (Luebeck Old Town), you'll be steps from Seafarer's Guild and St. Jakobi Church. When you stay at Ferienwohnungen Schwabe in Rerik, you'll be near the beach, within a 5-minute drive of Rerik Beach and Heimatmuseum. Free self parking is available onsite.